This is a very warm and fun earflap hat modeled after the one the lovely Jayne Cobb character wore in the TV show, Firefly. I used Dusty Pink, Antique Rose, and Beige of Vanna’s Choice yarn. To make the hat thick enough, I used a double strand of yarn. The long braids are perfect for tying under your chin. To make them, after casting-off, I switched to a J/10 crochet hook and chained 30. The main part of the hat (including the pom-pom) took three hours to knit. It took an additional evening to complete the earflaps and braids. If I had started earlier, I could have completed the entire hat in under 5 hours. 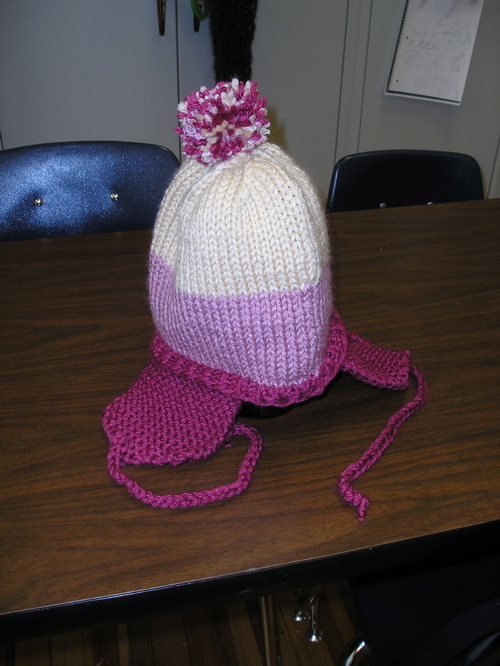 The pattern I used came from http://dryope.typepad.com/grove/2006/02/jayne_cobb_hat_.html. How was I frugal? I used leftover yarn from several other Jayne Cobb hats that I had made as Christmas presents. It began when I knitted a classic JC hat (Honey, Mustard, and Rust) for my husband. As soon as family members saw it in progress, I soon had requests for several more hats. When the air finally got cold and my former hat wasn’t keeping me warm, I used the yarn that I had leftover to make my own JC hat. The Jayne Cobb hat pattern is also great for making beanie hats with Homespun yarn. Leave off the earflaps and pom-pom. I seriously advise you not to make the pom-pom with Homespun, because of it’s tendency to shed all over your clothing and coat.